I am not a big shopper. I discovered years ago that retail therapy was not very effective for me. Frequently I order what I need online to avoid having to go to malls. So downsizing and simplifying have not been onerous for me. There are, however, two places where my acquisition monster comes roaring out. One is books, which I’ll write about in a subsequent post, and the other has to do with travel. If you were to wander around our room you would clearly see that there is something about the art and craft of other cultures that I find irresistibly appealing. I went to Vietnam with the best of intentions, but the struggle was mighty and I didn’t always win. I gave myself a pass for some gifts: a couple of cute embroidered dresses for our newest granddaughter, coconut candies and various little things for our house mates, friends and relatives. My biggest struggle came when we ate lunch at a terrific restaurant in Hue. Original art adorned the walls. The artist was there and told us about his works, which were very inexpensive. I wanted one so much I could hardly restrain myself. It was a perfect storm of desire – the artwork was deeply spiritual, I loved it, I wanted to support the artist, it was affordable, it would be a great reminder of a trip of a life time. It didn’t help when two of our traveling companions bought several between them. But, we have no more wall space in our room. The last thing we need is a painting. I walked away. I’d be lying, though, if I said I never think about contacting the artist and seeing if the one I loved most is still available. So here’s where I did give in: We got Bill a few shirts. He really needed them. I got three scarves. I didn’t really need them, but I will wear them and they don’t take up much room. The same goes for a small cloth purse. 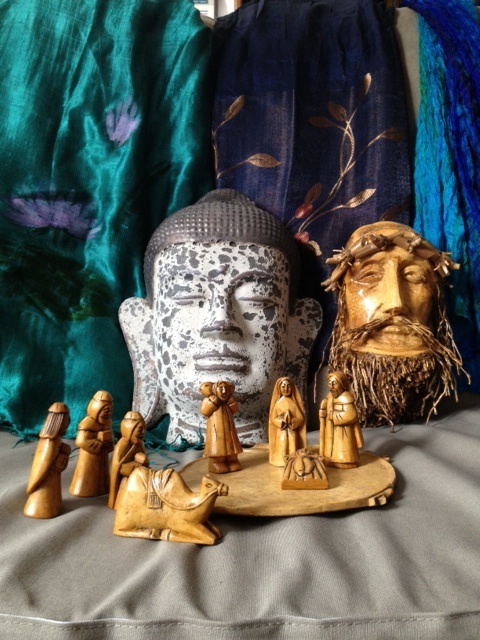 Straying a bit farther afield, I fell in love with a carved nativity set in which the figures all have Asian faces. It’s small enough to fit on a windowsill. Also got a carved wooden head of Jesus. Did I need them? Not really. I have to confess I already have a couple of nativity sets. The mystery of the Christian story fascinates me, though, and I love seeing how different cultures depict it. I successfully resisted the urge to buy a Buddha head, but we were then given a lovely one as a gift. Did I buy too much stuff? Most likely. It makes me wonder a lot about what this desire to have is all about. Advertising hammers us with messages that we need more. There is no evidence that having more makes us happier. In fact, critics of our consumer culture use the term affluenza to describe the dis – ease and dysfunction we experience from consuming too much. Bill and I are, in many ways, happier in our one room with far less stuff than we were in our four bedroom house filled with stuff. Unlike many of our sisters and brothers in the world we have, as Bill points out in an earlier post, enough. So why was it so hard to walk away from that painting? Why did I want more so much? What brings out your acquisition monster? How do you know what is enough? This entry was posted in Downsizing, Travel and tagged Posted by Carol Mitchell. Bookmark the permalink. I think the painting represented a strong visual representation of a great memory you wanted to be reminded of on a periodic basis. Traveling is tough… even for minimalists. Over the past few years only I’ve become quite adept at collecting pictures (mostly digitally through my phone) of objects that have a sentimental value to me. A ticket stub for a concert, an old childhood arts and crafts project, a sweater that’s far too small to be practical but was my favorite at one point. The pictures take up zero room, don’t collect dust, and yet they allow me to part with the object but not the memory. 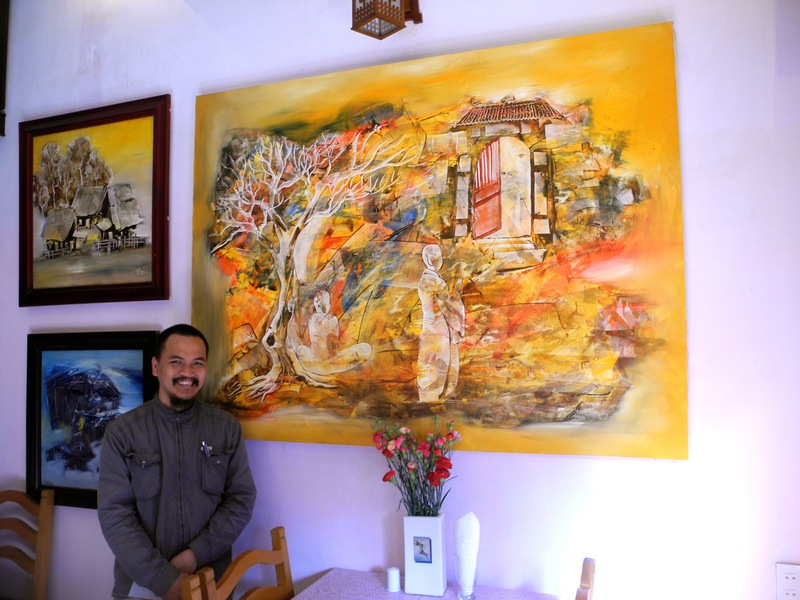 The way I look at it this great picture of your painting with the artist standing besides it with a big smile on his face is far more conducive of a great memory than having that painting hanging up in your room right now. The smells, and sounds that accompany that memory can be had with this one snapshot… more so I think than actually owning it. My personal hope is that in time the struggle to part ways with sentimental objects will become easier to the point of it becoming second nature. Thanks, Eddy. The idea of photos is a great suggestion. We did some of that when we downsized from a house to a room. I so appreciated your comment about the picture of the smiling artist with his work being being better in some ways than owning the painting. I think I’ll go with that. Thanks Hoang Thanh Phong. Anyone interested in his art can access it through the website he provided. The site can be translated into English by Google. We sold our house and everything in it six years ago in order to work around the world. We accumulated dozens of books and art works in Mexico and then in China and now in Mexico again. We end up giving away everything each time we move.